Make quality badge holders work for you! From company security and finances to work relationships and camaraderie, you may find that badge holders are perfect for any company or corporation. Discovering new ways to help your business thrive is a constant process. And finding simple ways to make that process easier is a great way to start. Enter badge holders! While they may be simple items, they are worth looking in to. And utilizing them will help your business in many ways. Here are four ways a plastic badge holder can benefit your business. 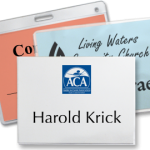 Your staff will quickly find their credentials or proximity cards when putting them in a badge holder. They won’t have to dig into their pockets or empty their purses. Clocking in and out is a much faster process for each work shift. Employees are also less likely to lose security items that are attached to their clothes or hanging around their necks. And nothing lost means that the company does not have to pay to replace them. Whether pinned to an employee’s chest or attached to a lanyard, badge holders with personal identification allow co-workers to get to know each other. They learn each others’ names, what job they have and which department in which they work. This knowledge fosters work relationships and camaraderie. It can also help new employees get to know their colleagues faster and feel more comfortable in their position. Is your company looking at name tags and thinking that they just won’t work? Or do you just have too high of a turn-over to invest in something so permanent? A badge holder may be just what you need! Badge holders are typically lightweight and easy to use. They also come in many different sizes to meet all of your needs. And, to make these personal identification tools even better, use the printable inserts that go with them. Just print a new name and title for every employee, thus making turn-over an easier adjustment. And it will keep costs down. 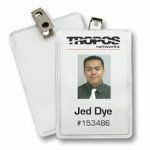 Employee identification typically includes names, job titles and sometimes a photo. When everyone wears this information in something like a badge holder, security personnel can see who is permitted access to the building. And this can decrease theft, impersonation and unauthorized visits. 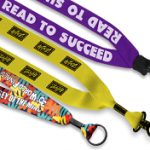 A strong, durable lanyard goes hand-in-hand with a badge holder. When using these tools together, make sure to have both sides of the badge holder contain the same information that when it swings on the lanyard, credentials and other vital information remains visible. Tips provided by guest author CreelaBelle Howard, content writer at Coller Industries.